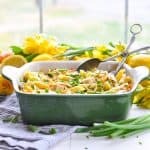 The most delicious, fresh and healthy Dump and Bake Spring Pasta that's packed full of nutritious vegetables and kids love it! 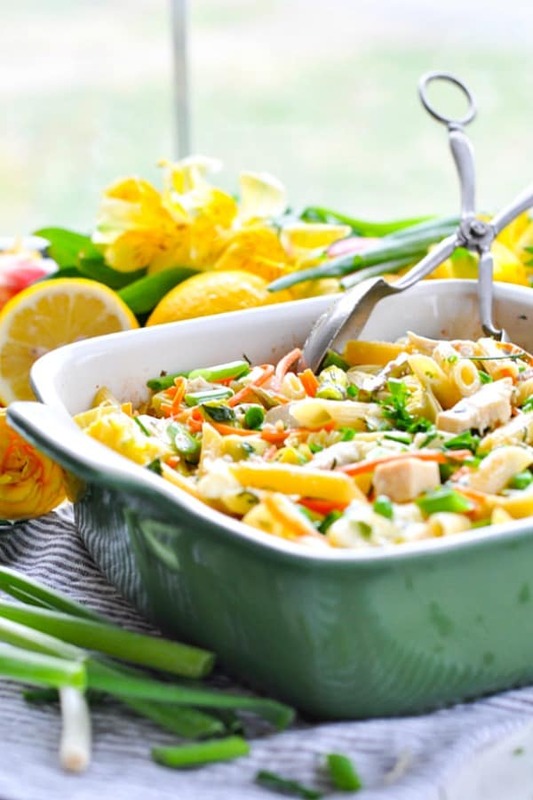 Pasta is baked with chicken and all of spring’s finest vegetables for a light and healthy one pot meal! 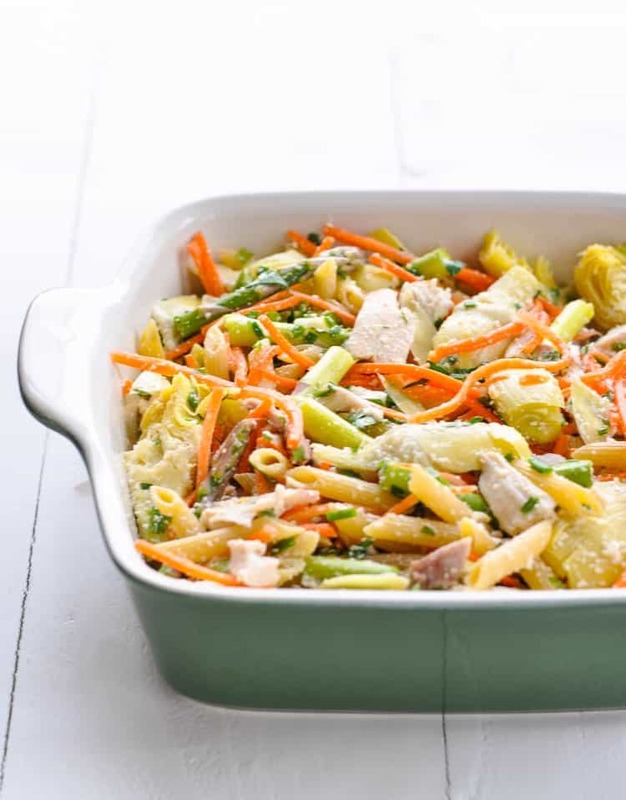 With asparagus, artichokes, carrots, peas, and chives, this easy Dump-and-Bake Spring Pasta has all of the fresh flavors that you crave — with just 10 minutes of prep. You don’t even have to boil the pasta! You guys — this is a meal that is LOADED with delicious vegetables…but it’s ALSO 100% approved by my PICKIEST little 4-year-old! If that’s not enough to convince you, then I don’t know what is! Maybe you’ll be further swayed by the fact that it’s full of flavor, yet low in calories, high in fiber, and high in protein? This Dump-and-Bake Spring Pasta is seriously The Holy Grail of easy weeknight dinners! 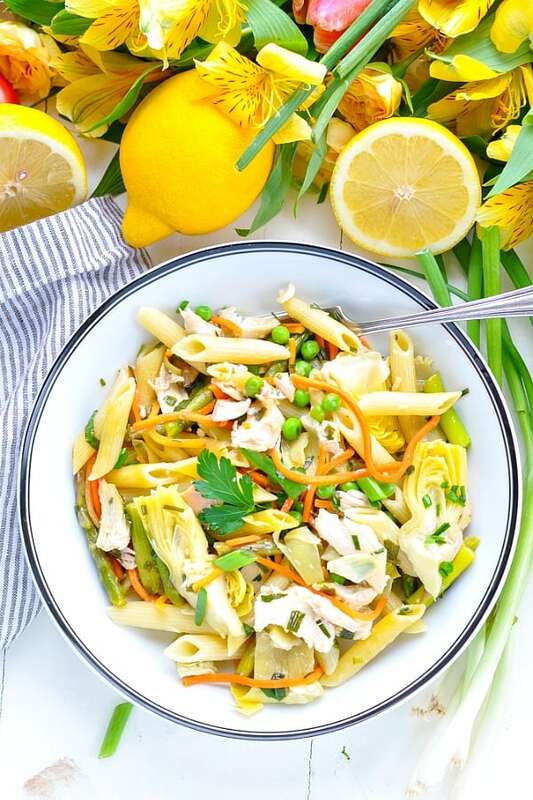 Spring Pasta – A Healthy Meal, Loaded with Veggies that Kids Love! When I first served the pasta to my husband and 3 boys for a Saturday night meal, I did so with trepidation. Let’s just say that the 4 males in my house aren’t exactly vegetable enthusiasts! But it just goes to show you that you should never assume that your kids won’t like a meal, just because it’s full of fresh produce. Instead, they all cleaned their plates, and little Spencer even asked for SECONDS…which almost never happens. He left the buttery biscuit on his plate, but devoured this Spring Pasta! I think the dish is appealing to kids because it bakes in a mild, garlic and Parmesan sauce. 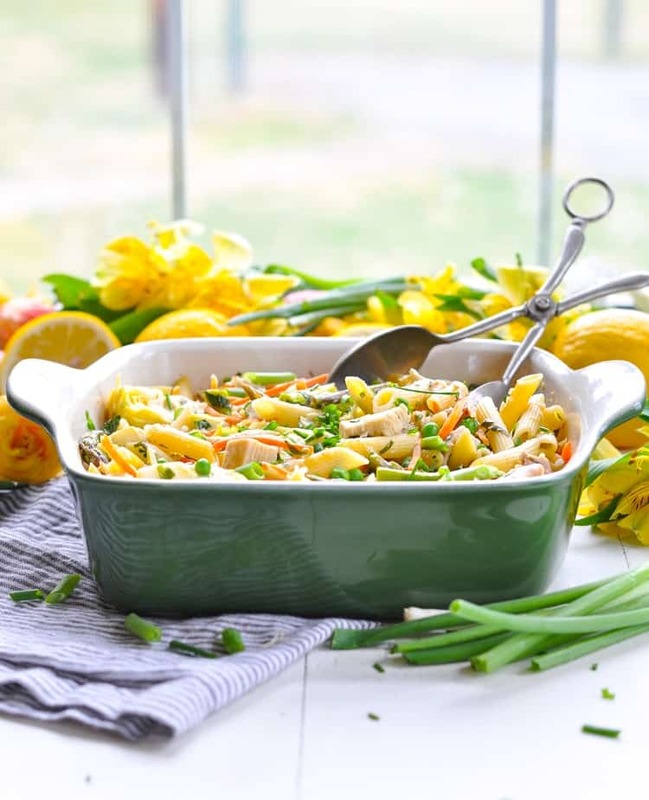 It’s not overpowering, but it’s flavorful enough to give the chicken and vegetables some personality! As usual, I’ve kept the recipe super-simple, thanks to the dump-and-bake method — which relies on a handful of shortcuts. Since artichokes are synonymous with “Spring” in my opinion, I knew that I wanted to include them in this recipe. 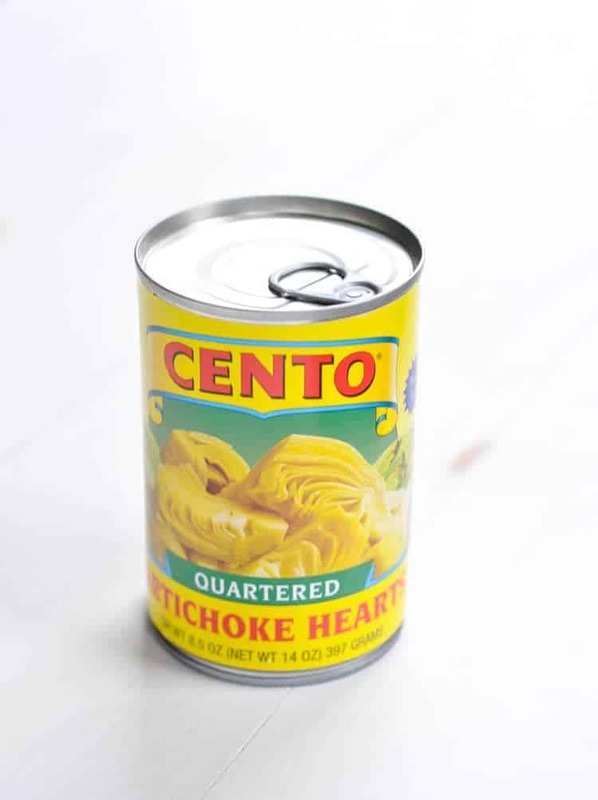 With quartered artichoke hearts, the work is already done for you! I also purchased a bag of “Matchstick Carrots” in the produce section, so that I could just “dump-and-bake” that ingredient as well (no hand grating required). Again, if you prefer to grate your carrots by hand, by all means…go for it! Really, the only prep work involved here is chopping up the asparagus and dicing the chicken. Which reminds me! 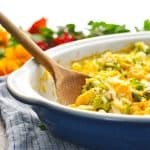 If you want to keep the meal vegetarian, you can definitely omit the chicken…and just add about a cup of additional vegetables in its place. I used some leftover rotisserie chicken from Costco in this meal, but pre-cooked and diced chicken from the grocery store (such as Tyson Grilled n’ Ready chicken strips) work nicely, too. Your ingredients (including the uncooked pasta) get tossed together in a dish, covered, and popped into the oven! It doesn’t look like there’s much liquid in here when it’s all stirred together, but trust me…there will be plenty of “sauce” in the end. The vegetables will release some additional liquid as they cook, while the starches from the pasta thicken everything up. The frozen peas (no thawing necessary) get stirred in at the very end so that they stay firm and bright green (instead of mushy and brown). With a final dusting of Parmesan, the end result is a beautiful, fresh, and healthy Spring Pasta — that your kids will actually eat! Cooking Just for Two? 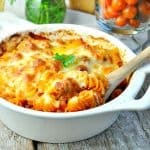 Cut the ingredients in half and bake the pasta in a 1-quart casserole dish. The cooking instructions remain the same. 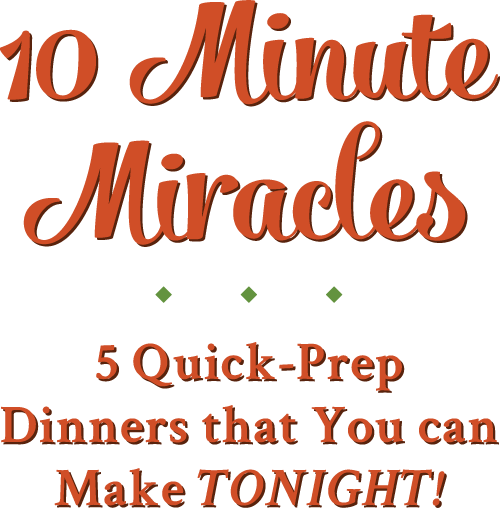 Use frozen and pre-prepped vegetables to cut down the prep time. Use a rotisserie chicken to make things easier or leftover roast chicken. Omit the chicken for a vegetarian option. I used penne pasta but any short pasta shape will do. Preheat oven to 425 degrees F (220C). Spray an 8-inch square baking dish with cooking spray. 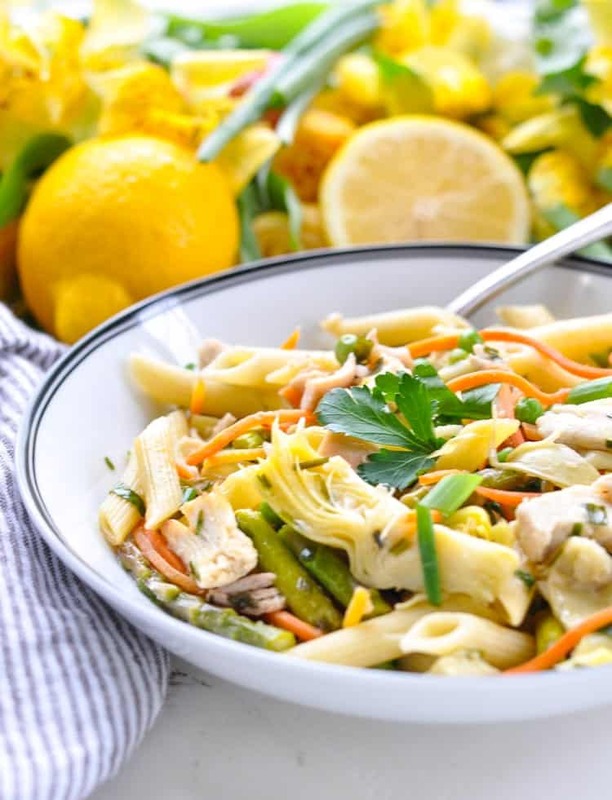 In the prepared dish (or in a separate bowl), stir together cooked chicken, artichoke hearts, asparagus, carrots, uncooked pasta, chicken broth, about half of the chives, half of the parsley, minced garlic, and salt, and 2 tablespoons of Parmesan. 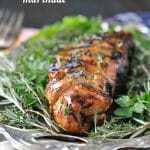 Cover the dish tightly with foil and bake for 35 minutes. Uncover; stir. At this point you should check the pasta to make sure that it is al dente (firm but just about finished cooking). If it’s still too hard, cover the dish and return to the oven until pasta is al dente. Then move on to the next step. Stir in the frozen peas and sprinkle remaining 2 tablespoons Parmesan over the top. Bake uncovered for 5-10 more minutes (or until pasta is tender). Garnish with remaining chives and parsley just before serving. This is such a pretty pasta, Blair! I love all of the colorful veggies in here. 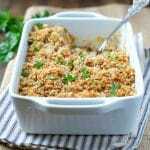 If it’s approved by your pickiest eater, then my husband will love this, too, as he can be selective with his veggies at times! 🙂 Sounds perfect for dinner now that the warmer weather is coming! 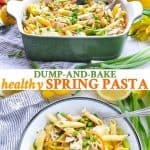 My 7 years old baby loves this dump-bake-spring-pasta so much! Sometimes i make this recipe.